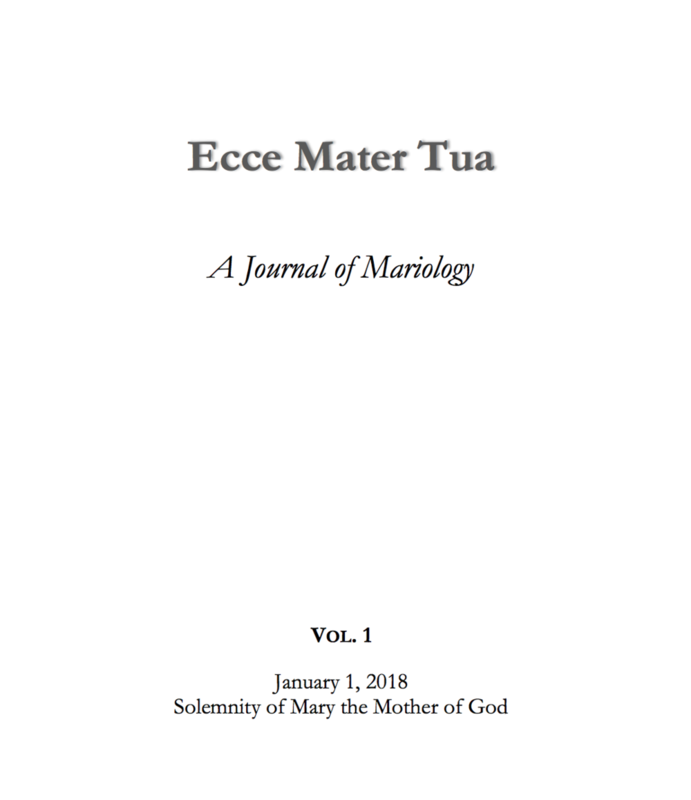 The “Documents” section contains the January 1, 2017 Document of the International Marian Association entitled, “Mary in the Redemption.” This document was produced by the 33-member Theological Commission of the IMA, and comprises as excellent synthesis of Marian Coredemption from the sources of Revelation, history, contemporary theology, and its present significance for the Church and the world today. Also found in the Documents section is a May 31, 2017 letter from an executive committee of the International Marian Association to the Prefect Emeritus of the Congregation for the Doctrine of Faith, Cardinal Gerhard Mueller. The IMA letter is directed to Cardinal Mueller in response to comments made in the text of his secular interview, The Mueller Report, in which he seems to call into question the legitimate use of the Co-redemptrix term, as well as the factual history of the use of the term by popes, saints, doctors, theologians, and mystics during a period spanning over 500 years of Church tradition. A second letter responding to Cardinal Mueller’s comments comes from Robert Fastiggi, Professor of Theology at Sacred Heart Major Seminary in Detroit and Vice-President of the IMA, and postulates both a charitable and truthful correction of the doctrinal and historical ambiguities contained in the comments by the former CDF prefect. An outstanding and courageous "Response to the Declaration of the International Pontifical Marian Academy " is authored by Msgr. Arthur Calkins, himself a member of PAMI, in what constitutes an updated response to the now 20 year old PAMI declaration. The “Essays” section offers a splendid “beauty in diversity” of several contemporary mariological themes. “On the Fittingness of the Title Mediatrix of all Graces as applied to the Blessed Virgin Mary” by Melissa Eitenmiller displays a fruitful commentary on this Marian title and doctrine in revelation and theology. “María Corredentora: Explicación y Conveniencia de su Proclamación Dogmática” by Agustin Gimenez speaks not only to the legitimacy of the Co-redemptrix doctrine, but also compelling reasons for its solemn proclamation at this particular moment in the history of the Church. “Catechetical Thinking in the Face of Critical Theory: Developing a Marian Understanding” by Petroc Willey identifies a Marian approach to catechetics which inherently corrects the errors brought forth from the modern “Critical Theory.” The Essays section concludes with “Woman, Motherhood, the Family, and the Mother of All Peoples,” an examination of authentic femininity and motherhood in relation to Mary as Spiritual Mother of All Peoples, and the potential historic benefits of a solemn definition of Spiritual Maternity in relaesing new graces for contemporary humanity in the midst of its multiform and ubiquitous global challenges. Finally, two important translations on the theology of Coredemption are making their first appearance in the English language. “Coredemption” (translated from the Italian by John-Mark Miravalle) is an excerpt from the writings of the Jean Galot, S.J., long time Vatican consultor, Professor at the Gregorianum, and contributor to the L’Osservatore Romano. Galot puts forth valuable distinctions and responses concerning the ongoing dialogue on the Co-redemptrix title, as well as new Pauline justifications for the title. “The Co-redeeming Mediation of Christians, the Church, the Virgin” an excerpt from the writings of renowned Swiss ecclesiologist, Charles Cardinal Journet (translated from the French by John O’Neill), discusses the question of Mary’s role as Co-redemptrix and her relation to the Church within both Christo-typical and ecclesio-typical models, and thus provides invaluable insight into the complementary missions of Mary Co-redemptrix and the co-redeeming Church.